Having version information on your assemblies that are deployed with your application can be useful for determining what code was actually used to create a compiled asset. Unfortunately the default versioning msbuild provides during a compilation is not extremely useful. You can enable auto-increment on the version numbers, but unless you track them in some way it can be difficult to trace the exact code used to build the assembly. It would be great if there was some way to version your assemblies as part of your continuous integration / deployment process. Note: If you don’t have a continuous integration process for your builds, you should! This way the artifacts that are created by a build for each push to your version control repository are versioned and tied to the source control assets. If you come across your assembly in the wild (on your server or a customer’s), it would be possible to tell exactly which build and source code commit were used to create the assembly. We’re using Team City as our build and deployment environment. JetBrains has made it extremely easy to add this type of information to the file version properties for an assembly. 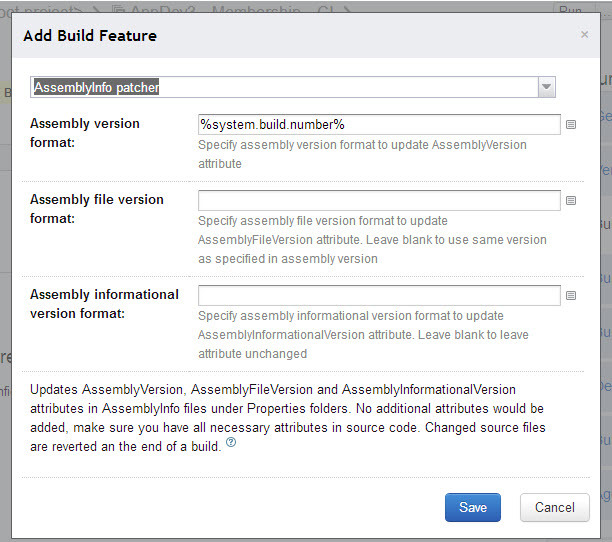 With only a small change to your normal build process you can add assembly versioning. I wasn’t aware that the Additional Build Feature functionality existed until I researched assembly versioning with Team City. I came across the AssemblyInfo Patcher feature in the Team City documentation. If you have created your application using standard Visual Studio solutions and projects then all your projects contain an AssemblyInfo.cs class in the Properties folder. This file contains information about your assembly that is used to define its file properties during compilation. It also holds information about paths to embedded resources as well as other compilation options for your assembly. The AssemblyInfo Patcher in Team City scans your entire working directory looking for files named AssemblyInfo.cs. When it finds these files it updates three of the properties: AssemblyVersion, AssemblyFileVersion, and AssemblyInformationalVersion. The first two (version and file version) need to be in the standard version format for assemblies (1.0.0.0) while the information version is free text. We will set all of these with the patcher and specifically use this free text field to store information about the git repository used to retrieve the source code for the build. Once this is selected you can see where the three assembly information properties may be set. In this case we’re setting the <build number> portion to the team city build number. If you would like to update the major, minor, or revision portions of your version you could obviously change these as well. You could even create custom environment variables in Team City that to set on build for these values (still leaving the build number up to team city). It is also possible to provide some details about the exact source code used to build the assembly. In order to unambiguously identify the source, we need three key pieces of information: repo url, branch name, and commit SHA. I know in theory the SHA uniquely identifies the commit, but the other pieces of information give some really useful context when you’re tracing the history of an assembly. What does this look like when it builds? When Team City builds your project it is going to search through all of your assemblyinfo.cs files and update them with this information. You will see this in your Team City Build log immediately proceeding your build log entries. Note: Repo location is an example only, it does not exist. That’s it. Now you have some very useful version information on every set of assembly artifacts you build and deploy! Nice article. TeamCIty V9.1 includes a new File Content Replacer which allows replacement of some other parameters too. See their documentation at https://confluence.jetbrains.com/display/TCD9/File+Content+Replacer for more details.